This is my personal R/C airplane website. Most topics are about F3A models since that is my main interest. My name is Jon Gunnar Wold and I live in Moss, south of Oslo with my wife and two daughters. 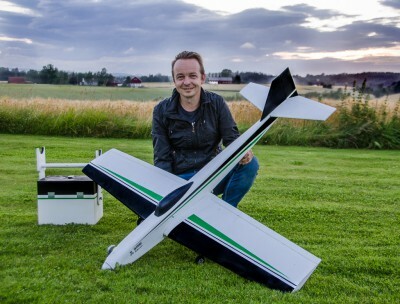 I am a member of Vingtor R/C club which is based in Oslo but our field is located at Kroer near Kråkstad, about 40 minutes from my house. I also fly with my local club in Moss. I started flying very early. My father flew control line and F1B Wakefield gliders so I had access to expert help and glue whenever I needed it. Unfortunately he did not fly R/C so we lost a few planes in the beginning, but after getting into gliders with two friends of mine we got the hang of R/C flying. Gliders really are a perfect way to get started. Next I had some mentoring from a former Norwegian F3A champion who taught me basic aerobatics on an EZ Decathlon. After that I flew sporadically, using up lots of F3A models and not really progressing much for about a decade (!). Things took off when I met an F3A flier at a local club who convinced me to try competition flying. He told me that I’d stop crashing if I started practicing schedules. And he was right, I have not lost a plane to pilot error since. In my professional life I spent many years working as a design and usability consultant. I used to be the head of design at FINN.no, Norways largest classified site, and then I enjoyed working for Steria, helping clients build useful and effective web solutions through carefully planned design processes. I have also written a Norwegian book about usability testing that was published in 2011. In 2012 I left my career in IT and joined the Norwegian Air Sport Federation NLF – Norges Luftsportforbund, and I currently work there as manager of the aeromodelling section. Yes, I work fulltime with modelling. When I’m not in the basement building stuff, I like to relax and read something. I read a lot of novels of all sorts, and some military non-fiction and biographies. I also subscribe to model airplane magazines, mostly German as they are the best. Other interests that usually don’t make the top of my list of priorities /(because F3A is always #1… ) include cars and motorsports, skiing and just being outdoors. Being outdoors AND flying is the greatest combo ever.